Alpha Centauri, the hunt for planets. Re: Alpha Centauri, the hunt for planets. There's the geometric probability which can be pretty low and ignores the mass distribution of planets which skews the transit probability favourably toward low RV-mass planets -- see this paper), and furthermore if the planet is roughly coplanar with the star system (which is tilted somewhat edge-on), the odds increase dramatically. I would not be as pessimistic as 10-30%... but 30% is still great odds. 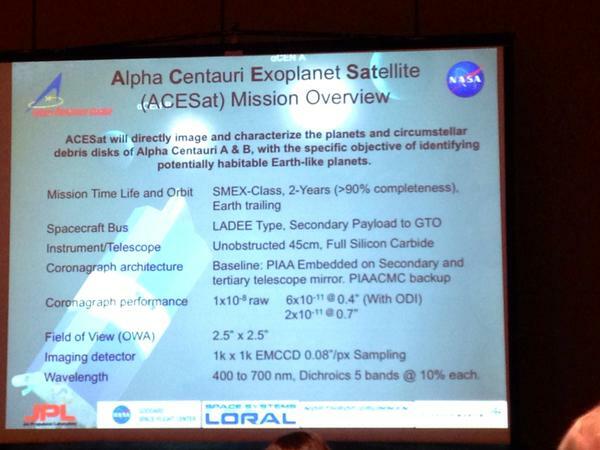 Alpha Centauri planet hunt update. In May, we observed Alpha Cen B almost every night. The new tip-tilt system brought more photons into the FINDS fiber - on single stars we measured an efficiency improvement of about 8%. Unfortunately, even with the improved guiding, the contamination from Alpha Cen A was significant on several of our nights when there was poor seeing. I've spoken with Xavier Dumusque on the Geneva team and they have similar results with the HARPS data. We are now revising our analysis code to see if we can model out this contamination. Fingers crossed, we'll have some results soon. The search for true Earth analogs faces several challenges and one of them is identification and removal of signals on the surface of the star. Stars are boiling cauldrons of plasma threaded with magnetic fields. The photospheres of the stars have spots, flares, granulation, pulsations and other flows that are imprinted in the stellar spectrum and obscure tiny signals from small rocky worlds. To understand these sources of stellar noise, we are using CHIRON on other stars, including Tau Ceti and Epsilon Eridani, two stars that Frank Drake observed with Project Ozma. Tau Ceti is a favorite of Doppler planet hunters because the stellar velocities are so constant... or are they? A recent analysis by Tuomi et al. suggests that low amplitude signals may be embedded in the data. We are now able to check that result. Epsilon Eridani is a more challenging star with spots that mimic Doppler velocity signals. We are writing up our results for that star now - by luck, we caught the star during a stretch when it had large persistent spots; this data set is a training ground for my students who are writing computer algorithms to identify and de-correlate stellar noise from Doppler data. This work is part of an ongoing project which aims to detect terrestrial planets in our neighbouring star system α Centauri using the Doppler method. Owing to the small angular separation between the two components of the α Cen AB binary system, the observations will to some extent be contaminated with light coming from the other star. We are accurately determining the amount of contamination for every observation by measuring the relative strengths of the H-α and NaD lines. Furthermore, we have developed a modified version of a well established Doppler code that is modelling the observations using two stellar templates simultaneously. With this method we can significantly reduce the scatter of the radial velocity measurements due to spectral cross-contamination and hence increase our chances of detecting the tiny signature caused by potential Earth-mass planets. After correcting for the contamination we achieve radial velocity precision of ∼2.5ms −1 for a given night of observations. We have also applied this new Doppler code to four southern double-lined spectroscopic binary systems (HR159, HR913, HR7578, HD181958) and have successfully recovered radial velocities for both components simultaneously. We are currently in the process of reducing all ∼47000 observations of the two stars with the method described above and expect that we can scrutinize the reality of the putative planet in a 3.24-d orbit around α Cen B once we have a full set of corrected RVs. Debra Fischer had an interview with Planetary Radio about the laser comb calibrator. Starts at around 8:00. Alpha Centauri observations are currently on hold until 2016 due to their proximity. EXPRESS is maybe two or three years from first light. CHIRON comissioning. Reached half-metre per second precision, but new signals started appearing. Likely caused by motion of gas in the star. Two, almost three year dataset achieved for three stars with "exciting discoveries in astrophysics" including how to get higher precisions. Males et al. "Orbital Differential Imaging: A New High-Contrast Post-Processing Technique For Direct Imaging of Exoplanets"
Belikov et al. "How to Directly Image a Habitable Planet Around Alpha Centauri with a ~30-45cm Space Telescope"
Bendek et al. "Space telescope design to directly image the habitable zone of Alpha Centauri"
Thomas et al. "A method to directly image exoplanets in multi-star systems such as Alpha-Centauri"
New orbit determination for the Alpha Centauri AB binary, that now seems to be in line with the asteroseimology results for the stellar masses. The parallax is consistent with the original version of the Hipparcos catalogue but not with the new revision. Pourbaix & Boffin "Parallax and masses of α Centauri revisited"
Since Dumusque was the lead author of the discovery paper for Alpha Cen Bb, It would seem that the HARPS team has changed footing. Certainly, this is no fault of theirs; this was the first attempt to deal with such complex data, and mistakes are very possible. At this point, I would say it would be reasonable to no longer consider the 3.24-d planet as valid. It remains to be seen whether Alpha Centauri hosts any (detectable) planets, Proxima included. Well at the time the Rajpaul et al. paper was published, the statements from Dumusque in the National Geographic news story indicated that they basically agreed with the findings. The telescope will take 3-4 years to construct and launch. Once in orbit, Project Blue will perform an intensive two-year study of Alpha Centauri -- the closest star system to Earth -- with the goal of identifying and capturing a "pale blue dot" image of an Earth-size exoplanet in the habitable zone of the Alpha Centauri A and B stars. Zhao et al. "Planet Detectability in the Alpha Centauri System"
Current detection limits for planets in the HZ around the stars are m sin i of 53 Earth masses (α Cen A), 8.4 Earth masses (α Cen B) and 0.47 Earth masses (Proxima), though this is in the best case scenario of white noise. For red noise, the detection limits increase. The apparent separation of the A and B stars should allow for high precision RV measurements from 2019–2020. ESO recently joined the search for habitable worlds around other stars in collaboration with the Breakthrough Initiatives, a large-scale science programme to search for extraterrestrial intelligence. We chatted to Markus Kasper, ESO exoplanet expert, to learn more.